The Hepatitis A vaccine can help prevent Hepatitis A. There are a number of different types of vaccinations available including the Twinrix vaccine which also prevents Hepatitis B. Most vaccinations require multiple shots. All vaccinations are similar in terms of how well they protect from the virus and their side-effects. Depending on your personal medical history and where you are traveling, our clinic will advise which vaccination is recommended for your trip. Contact us at (416) 461-2419 today or click here to book online. Hepatitis A is a viral disease that is common in developing countries and is generally associated with poor sanitation and poor hygiene. It is one of the most common vaccine-preventable illnesses in travelers. Your risk depends on several factors: destination, length of trip, and your living conditions. The risk of hepatitis A exists even for travelers going for short periods of time to urban areas, staying in luxury hotels and who follow good hygiene and water and food precautions. The hepatitis A virus is found in the stool (feces) of an infected person. It can be spread through contaminated food and water or through close contact with an infected person. Certain uncooked foods such as shellfish, fruits or salads can be contaminated, as well as foods that are prepared in unsanitary conditions or by an infected person with unsafe food handling practices. in day cares, households, schools, etc. less commonly, through sexual contact. Infection with the virus gives lifelong immunity (protection) against the virus. Symptoms can take from 15 to 50 days to appear (average 28 days). Some people who are infected have no symptoms, others may have only mild symptoms that last from 1 to 2 weeks and some may experience more severe symptoms that can last several months. In children, symptoms are mild to non-existent. Severity of the illness increases with age. Symptoms can include fever, fatigue, loss of appetite, nausea and vomiting, abdominal discomfort, dark urine and grey-colored stool, jaundice (yellowing of skin and whites of eyes). In severe and rare occasions, symptoms can include liver damage, liver failure, or death. Individuals with pre-existing chronic liver disease and older people are most at risk for this. Recovery generally takes a few weeks, but can take months. Most people recover without side effects and have lifelong immunity against hepatitis A. There is no treatment for hepatitis A, only supportive care to help relieve symptoms. Where is hepatitis A a concern? Hepatitis A occurs worldwide but is more common in regions with poor sanitation and lack of safe food and water. Regions where there is a high risk of hepatitis A transmission include Africa, Asia and Central and South America. 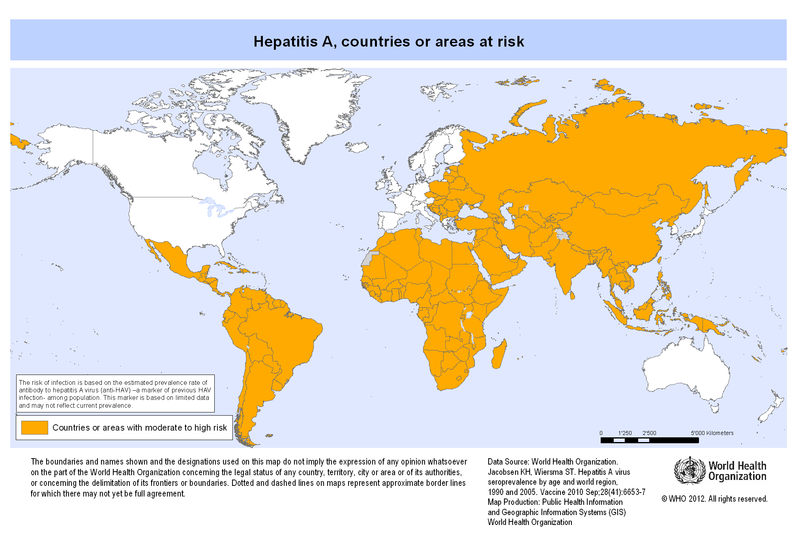 A map of countries and areas of risk for hepatitis A is available on the World Health Organization (WHO) website. Wash your hands with soap under warm running water for at least 20 seconds, as often as possible, including before eating or preparing food and after using the bathroom or changing diapers. traveling to countries where hepatitis A occurs. visiting areas where drinking water may be unsafe and poor sanitation and hygiene conditions exist. If you develop symptoms similar to hepatitis A when you are traveling or after you return, see a health care provider and tell them where you have been traveling or living. Source: © All rights reserved. Hepatitis A. Public Health Agency of Canada, 2016, with permission from the Minister of Health, 2017.